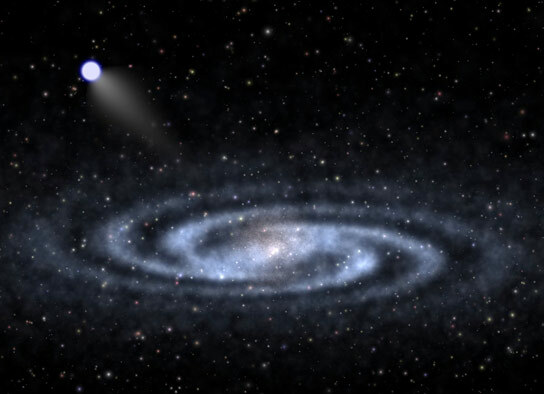 In a newly published study, astronomers report the first hypervelocity star (HVS) discovered from the LAMOST spectroscopic survey – a B-type star with a speed of about 1.1 million mph relative to the speed of the center of the Milky Way. A University of Utah-led team discovered a “hypervelocity star” that is the closest, second-brightest and among the largest of 20 found so far. Speeding at more than 1 million mph, the star may provide clues about the supermassive black hole at the center of our Milky Way and the halo of mysterious “dark matter” surrounding the galaxy, astronomers say. “The hypervelocity star tells us a lot about our galaxy – especially its center and the dark matter halo,” says Zheng Zheng, an assistant professor of physics and astronomy and lead author of the study published recently in Astrophysical Journal Letters by a team of U.S. and Chinese astronomers. In the past decade, astronomers have found about 20 of these odd stars. Hypervelocity stars appear to be remaining pairs of binary stars that once orbited each other and got too close to the supermassive black hole at the galaxy’s center. Intense gravity from the black hole – which has the mass of 4 million stars like our sun – captures one star so it orbits the hole closely, and slingshots the other on a trajectory headed beyond the galaxy. Zheng and his colleagues discovered the new hypervelocity star while conducting other research into stars with the Large Sky Area Multi-Object Fiber Spectroscopic Telescope, or LAMOST, located at the Xinglong Observing Station of the National Astronomical Observatories of China, about 110 miles northeast of Beijing. LAMOST boasts a 13.1-foot-wide aperture and houses 4,000 optical fibers, which capture “spectra” or light-wavelength readings from as many as 4,000 stars at once. A star’s spectrum reveals information about its velocity, temperature, luminosity and size. LAMOST’s main purpose is to study the distribution of stars in the Milky Way, and thus the galaxy’s structure. The new hypervelocity star – named LAMOST-HVS1 – stood out because its speed is almost three times the usual star’s 500,000-mph pace through space: 1.4 million mph relative to our solar system. Its speed is about 1.1 million mph relative to the speed of the center of the Milky Way. Despite being the closest hypervelocity star, it nonetheless is 249 quadrillion miles from Earth. (In U.S. usage, a quadrillion is 1,000,000,000,000,000 miles or 10 to the 15th power, or 1 million billion). A cluster of known hypervelocity stars, including the new one, is located above the disk of our Milky Way galaxy, and their distribution in the sky suggests they originated near the galaxy’s center, Zheng says. The diameter of the visible part of our spiral-shaped galaxy is at least 100,000 light years, or 588 quadrillion miles. Zheng says that when the halo of dark matter is added, the estimated diameter is roughly 1 million light years, or 5,880 quadrillion miles. Scientists know dark matter halos surround galaxies because the way their gravity affects the motion of a galaxy’s visible stars and gas clouds. Researchers say only about 5 percent of the universe is made of visible matter, 27 percent is invisible and yet-unidentified dark matter and 68 percent is even more mysterious dark energy, responsible for accelerating the expansion of the universe. By traveling through the dark matter halo, the new hypervelocity star’s speed and trajectory can reveal something about the mysterious halo. Our solar system is roughly 26,000 light years or 153 quadrillion miles from the center of the galaxy – more than halfway out from the center of the visible disk. By comparison, the new hypervelocity star is about 62,000 light years or 364 quadrillion miles from the galactic center, beyond as well as above the galaxy’s visible disk. It is about 42,400 light years from Earth, or about 249 quadrillion miles away. As far as that is – the star has a magnitude of about 13, or 630 times fainter than stars that barely can be seen with the naked eye – it nevertheless “is the nearest, second-brightest, and one of the three most massive hypervelocity stars discovered so far,” Zheng says. It is nine times more massive than our sun, which makes it very similar to another hypervelocity star known as HE 0437-5439, discovered in 2005, and both are smaller than HD 271791, which was discovered in 2008 and is 11 times more massive than the sun. As seen from Earth, only HD 271791 is brighter than LAMOST-HVS1, Zheng says. The newly discovered hypervelocity star also outshines our own sun: It is four times hotter and about 3,400 times brighter (if viewed from the same distance). But compared with our 4.6-billion-year-old sun, the newly discovered LAMOST–HVS1 is a youngster born only 32 million years ago, based on its speed and position, Zheng says. Is there any chance that the supermassive black hole might hurl a hypervelocity star in Earth’s direction one day? Not really, Zheng says. First, astrophysicists estimate only one hypervelocity star is launched every 100,000 years. Second, possible trajectories of stars near the supermassive black hole don’t forebode any danger, should any of them become a hypervelocity star in the future. Zheng conducted the study with researchers from Rensselaer Polytechnic Institute, Troy, New York; National Optical Astronomy Observatory, Tucson, Arizona; National Astronomical Observatories, Chinese Academy of Sciences, Beijing and Nanjing; Spitzer Science Center, Pasadena, California; University of California Observatories-Lick Observatory, University of California, Santa Cruz; Georgia State University, Atlanta; Fermi National Accelerator Laboratory, Batavia, Illinois; and University of Science and Technology of China, Hefei. The study was funded by the U.S. National Science Foundation and the National Development and Reform Commission of China. Be the first to comment on "Astronomers Discover Hypervelocity Star Moving at More Than 1 Million MPH"